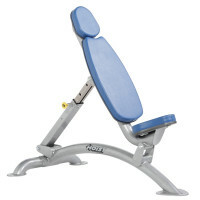 6 adjustable back pad positions from 0º to 80º in 10º increments for incline and flat bench exercises. 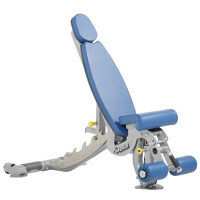 5 adjustable ratcheting seat positions accommodate varying user heights. Integrated hand grip and wheels provide tilt ‘n roll capability for easy storage. 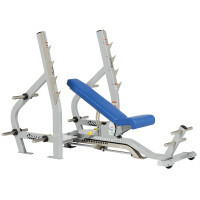 7 back pad positions adjust from -15º to 80º for flat incline and decline bench exercises. Self-aligning roller pads provide leg support during exercises. Gas-shock assisted seat easily adjusts into 5 seat positions for varying user heights. Integrated hand grip and wheels provide tilt ‘n roll capability for easy storage. 5 angled back pad positions adjust from 35º to 75º in 10º increments. Contoured seat pad ensures comfort during workout. Curved frame uprights match the natural arc of the exercise movement. Incorporates 10 weight plate holders for easy storage. Curved frame uprights match the natural arc of the exercise movement. 15º angle on back pad for decline bench exercises. Incorporates 10 weight plate holders for easy storage. Adjustable and self-aligning leg roller pads to accommodate varying leg length. 60º pad angle increases resistance while decreasing elbow strain. 8 adjustable ratcheting seat positions to accommodate varying user heights. 2 adjustable bar rack-out position. Ratcheting preacher pad adjusts easily and quickly to accommodate varying user sizes. 2-Sided pad to accommodate 2 different curl positions (angled / vertical). Walk-up design for easy entry and exit. 10 adjustable back pad positions from -15º to 30º in 5º increments to accommodate incline, flat and decline bench exercises. 16 linear adjustments to accommodate the varying user heights. 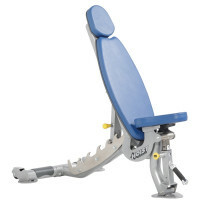 Integrated dual position foot rests to accommodate proper exercise positions. Incorporates 12 weight plate holders for easy storage. Spotter stand provides more leverage and better positioning. 5 angled positions adjust in 5º increments from 0º to -20º for flat and decline bench exercises. 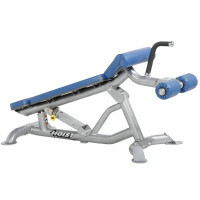 Multi-purpose design also allows for abdominal bench exercises. Self-aligning roller pads accommodate varying leg length.